Delightful serendipity! Yesterday I found a post about a strange Victorian hat-fitting device – The Conformateur. I had never heard of such a thing before, but the Victorians did come up with some fascinatingly innovative (though not always practical / functional) devices. Essentially, you place a piece of paper in the top of the device and place it on your head. “Fingers” in the device press to the shape or your head and make pin marks in the paper, late allowing the milliner to replicate the shape for a custom-fit hat. Lots of pics on the originating site, including detailed shots of the workings and original diagrams. Here is another post about another conformateur owner who used 3D printed parts used to repair their device. The provided diagram is misleading. It makes it appear that everything is round. This cannot be accurate as your head is oval. So you have an oval in a round shape. This also means that when the pattern measurements say that the width or the part that sits on your head is 2 5/8″, that will be at different angles at front, back and sides. This differs from most hats you might make today in that the headsize opening is usually the inside of the brim that you see, leading out to the edge of the brim. This had has a headsize opening burried up and inside the sides of the hat. The inside frame could almost be free floating, but this would affect the tilt of the hat, which would probably look better at a static point. 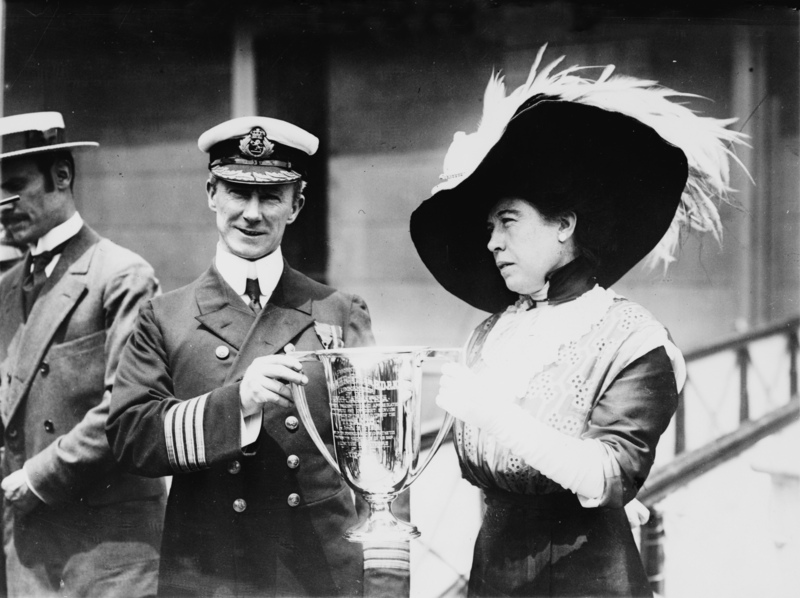 When I think of hats of the Titanic era, I think of the giant brimmed picture hats, but of course, that was not the only hat worn. The 1912 Project has given us a March Challenge Pattern of a Spring Hat for Mature Women, which I’ve decided to dub The Mad March Hat. So the 1912 Project began and I was so excited. I couldn’t wait for my first pattern. But there was much admin and organizational work to do and I had to be patient. Eventually (about 2 weeks ago) I finally got a pattern. Not the Group 24 pattern, but the Feb Challenge Pattern, a slip (#0336). I have to admit I was disappointed. I’d seen the available patterns and had my heart set on a beautiful coat. The slip seemed dull and like nothing I’d ever wear. Since women in 1912 were still corseted, what would the slip dimensions be? If I were to make the slip, did I have the proper foundation garments? Threads Magazine recently had a great article about The Metropolitan Museum of Art’s online collections database. The database is extensive, with over 43,000 costume pieces. Better yet, you can narrow your search down by time period, material, manufacturer and location. Each item listing includes photos, materials and maker info as well as time period, when known. The image quality is exceptional, allowing you to zoom in quite close on the details. 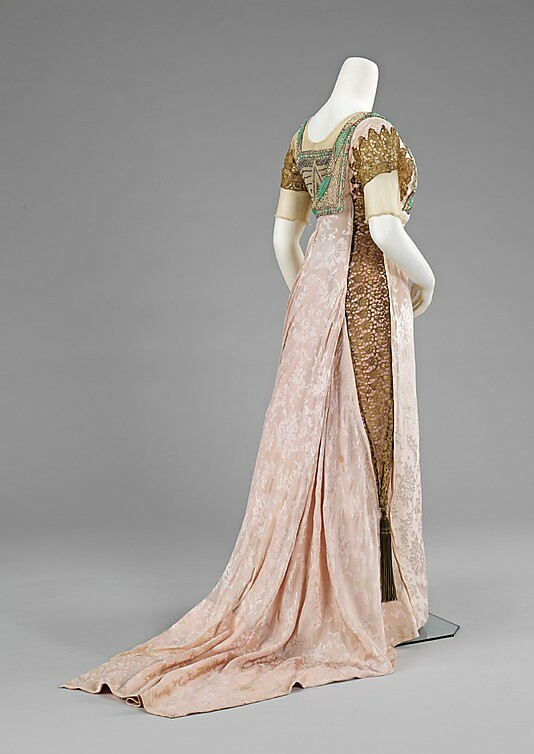 Here’s a piece I’m already interested in: a 1912 Egyptian Revival evening gown of silk, metal and rhinestone. I’m really fascinated by the lace detail on the right side (which I believe is only attached where the bodice and skirt join) and the way fullness is created on the back sides for the train. The front and back of the bodice are asymmetrical and the back gives the look of a second layer folded down over an under layer. The materials look rich in a way that we usually only see on the red carpet these days. I’m not sure, but I think the train may be slightly asymmetrical as well.